On Saturday, June 6, the eleventh “Playing For The Planet” benefit concert will showcase master musicians from three different musical traditions in a rare evening of pan-cultural improvisation, with all proceeds going to benefit the environmental advocacy group 350MA.org. 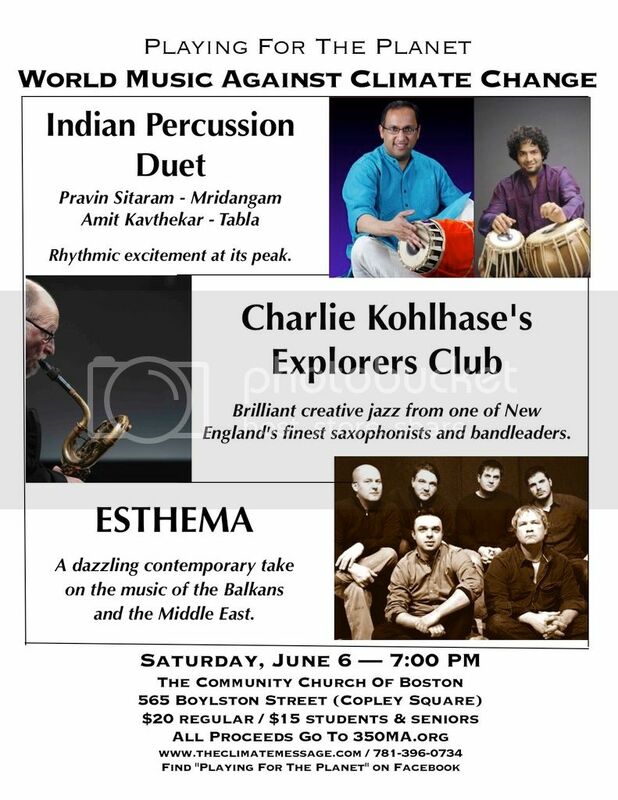 The performers include the brilliant jazz of Charlie Kohlhase’s “Explorers’ Club”, Esthema’s contemporary take on Balkan and Middle-Eastern traditions, and the awe-inspiring Indian rhythm duet of Pravin Sitaram and Amit Kavthekar. The music begins at 7:00 pm, at The Community Church Of Boston, 565 Boylston Street (Copley Square), Boston. Admission is $20; $15 students & seniors. For information, please call 781-396-0734, or visit the event website at www.warrensenders.com. Advance orders will be accepted until 3 pm on June 6. “Playing For The Planet: World Music Against Climate Change” is the eleventh concert in an ongoing series of cross-cultural events produced by Boston-area musician and environmental activist Warren Senders. These concerts were conceived as a way for creative musicians to contribute to the urgent struggle against global warming. Their choice of beneficiary, 350MA.org, is focused on building global consensus on reduction of atmospheric CO2 levels — action which climatologists agree is necessary to avoid catastrophic outcomes. Esthema is a Boston-based ensemble of boundary-bending virtuosi who’ve been developing their unique sound since 2006, fusing progressive rock and jazz-fusion with the sounds of the traditional music of the Balkan region and the Near & Middle East. Andy Milas (guitar), Onur Dilisen (violin), Naseem Alatrash (cello), Mac Ritchey (oud & bouzouki), Tom Martin (bass), and George Lernis (drums & percussion) bring together both Western and Eastern influences, instruments, and concepts in a richly evocative musical tapestry. Since then, Esthema has been in the weekly Top 20 at Latch Fusion Radio alongside Fusion greats like Herbie Hancock, Return to Forever, and the Mahavishnu Orchestra; they have won the Top 25 of 2011 Award at Indie-Music.com, and their composition “Eastern Dance” went to number 4 on the Instrumental Charts at Indie-Music.com. In 2010 the International Association of Independent Recording Artists (“IAIRA”) certified Esthema’s “Eastern Dance” as an International Top 10. Compositions from all three releases are heard on radio programs and stations throughout the United States, Europe, and Turkey. For information please visit www.esthema.com. One of the most exciting forms of Indian classical music is the percussion duet. Blending passionate virtuosity with intricate mathematics and endlessly transforming rhythms, there is nothing remotely close to the power and ebullience two brilliant drummers bring when they interact. Boston is very lucky to have great artists like Pravin Sitaram and Amit Kavthekar to offer this experience to listeners. Dr. Pravin Sitaram was introduced to mridangam at the age of 8, and has learnt this art from his Guru, Late Shri P. S. Parameswaran – a disciple of the legendary Palghat T. S. Mani Iyer. He was also fortunate to have advanced lessons with the Late Palghat R. Raghu. Pravin’s sensitive and unobtrusive approach to mridangam accompaniment has been appreciated by outstanding artistes like Dr. R. K. Srikantan, Smt. R. Vedavalli & Madurai Shri T. N. Seshagopalan, Shri T. M. Krishna, Violin maestros – Shri G. J. R. Krishnan, Lalgudi Smt. Vijayalakshmi, and Shri Mysore Manjunath. Pravin has worked with many talents in the New England area and has participated in cross-cultural exchanges in music. Pravin is a well-known teacher in the Boston area, teaching mridangam to many students over the past several years, several of whom are now performing for concerts in the New England area. 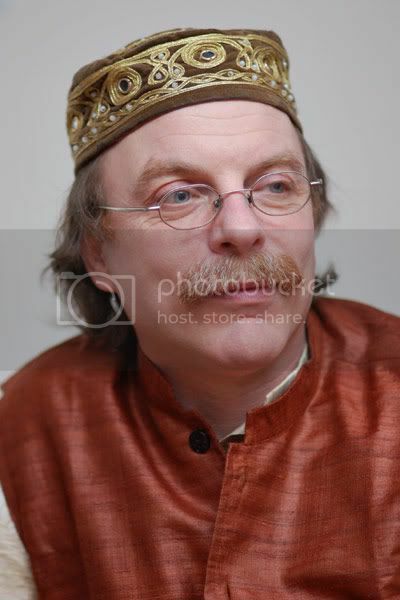 He has been a faculty member at the Learnquest Academy of Music since 2003. His students have participated and won prizes in competitions held in North America. Amit Kavthekar, a formally-recognized disciple of the tabla master Ustad Alla Rakha, has rhythm running in his veins. At the early age of six, he began learning the art of tabla playing, and he has performed with legends of Indian classical music as well as fusion and experimental projects. His dexterity and virtuosity have elicited applause and admiration all over the world. Amit teaches Tabla in the American School of Bombay (ASB), in New England School of Music, and as the director of the World Music Ensemble at Salem State University for the World Music Ensemble. Alto and baritone saxophonist Charlie Kohlhase has been a part of Boston’s jazz scene for more than thirty years. After private studies with Stan Strickland and Roswell Rudd, Kohlhase moved to Boston from his native New Hampshire in 1980. In 1989 he formed the Charlie Kohlhase Quintet, a band that worked around Boston and toured nationally for a dozen years. Kohlhase has recently been leading two ensembles: the Explorers’ Club, a septet with two reeds, trombone, guitar, bass and two drummers and the Saxophone Support Group, a woodwind octet playing saxophone-oriented compositions by Julius Hemphill, Steve Lacy, John Tchicai and Kohlhase. 2009 saw the release of the Explorers Club CD “Adventures” on Vermont’s Boxholder label. Kohlhase also co-led groups with the late, great Danish/ Congolese saxophonist John Tchicai for New England tours in 1993, 1997, 1998, 2003 and 2006. Charlie was a member of Boston’s Either/ Orchestra from 1987 to 2001, playing throughout North America, Europe and Russia. Recent sideman activities have included work with the Makanda Project, an Octet dedicated to performing unrecorded compositions by the late woodwind player/composer Makanda Ken McIntyre, bassist Kit Demos’ Flame-Tet and trumpeter Daniel Rosenthal’s Quintet. Charlie, along with Dave Douglas and Roswell Rudd, was an artist-in-residence at Harvard for Spring 2003. In May 2003 Kohlhase recorded with Anthony Braxton’s Genome Project and in June worked with violinist/composer Leroy Jenkins at Boston’s Institute of Contemporary Art. Charlie rejoined the Either/Orchestra in 2008 and has worked with them along with Ethio-Jazz greats Mahmoud Ahmed, Mulatu Astatke, Alemayhu Eschete and Teshome Mitiku in venues ranging from Chicago to London, Toronto to Germany and Holland to Ethiopia. Charlie has also been active in jazz radio for many years, most recently hosting “Research & Development” Monday afternoons from 2 to 4 PM on WMBR-FM in Cambridge. He directs the Modern American Music Repertory Ensemble at the Longy School of Music in Cambridge. 350MA.org is the Massachusetts Chapter of this worldwide advocacy group, and the hub for the Better Future Project. The Community Church of Boston is a free community united for the study and practice of universal religion, seeking to apply ethical ideals to individual life and the democratic and cooperative principle to all forms of social and economic life. We invite you to read on to discover more about us, join us one Sunday for a thought-provoking and joyful time, or contact the church to find out more about our community: info@communitychurchofboston.org. Warren Senders is the contact person for “World Music Against Climate Change.” He is one of thousands of concerned global citizens hoping to trigger positive change through social action and the arts. He can be reached at warvij@verizon.net or by telephone at 781-396-0734.